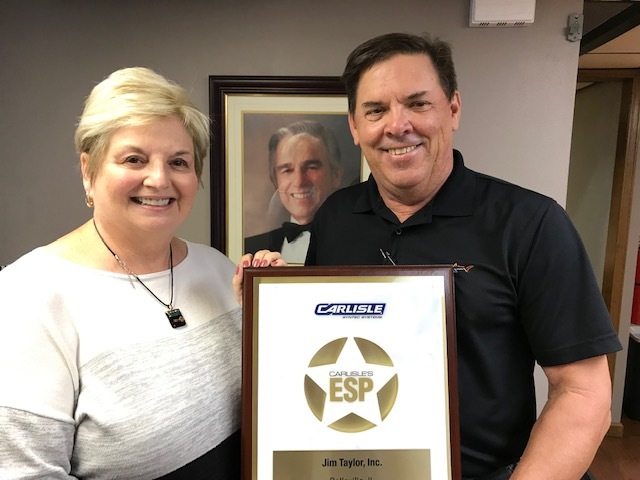 Jim Taylor, Inc. receives Carlisle SynTec Systems ESP Award - Luna and Associates - Specializing in commercial roofing products in Missouri, Illinois, Nebraska, Kansas and Iowa. Congratulations to Catherine Taylor Yank, President of Jim Taylor, Inc., and the entire Taylor crew for receiving Carlisle SynTec Systems ESP Award!!! The ESP award was established in 1998 as a means to recognize Carlisle’s most loyal and dedicated authorized applicators, the Excellence in Single-Ply award (ESP) award has become one of the most recognizable and prestigious achievements in the commercial roofing industry. Awarded annually, only the most accomplished applicators achieve ESP status, a designation that provides customers with conﬁdence that they have partnered with the very best in the industry. Presenting the award Greg Luna, President of Luna & Associates, LLC, the local Carlisle representatives. Congratulations!! !